Dungeon Mastering is Cooperative Pantsing. When it comes to writing, I am–for the most part–a Pantser. When I come up with ideas to write about, they usually start with a premise about an event or technological breakthrough that makes a big splash on society. Most of the time, the society is human or a mix of human and alien. It may be futuristic, dystopic, or it could even be otherworldly or magical in nature. The setting rarely matters. My point is that my ideas don’t start as an outline for a full story with a discreet start, middle, and end. Instead, I have to come up with the story that happens in my ‘imaginary world’ as I go along. I have an instigating event, into which I add characters to experience it. I write their reactions to this event in my imaginary world, and then I write some more… and some more… and some more. Eventually, I come up with the ‘big problem’ for them to overcome (if the instigating event wasn’t it already), at which point I know what the whole story is going to be about and how it will end (i.e. getting the problem solved). After that, I have to go back and fill in the middle. I never know how long it’s going to take for my characters to fix their problem, so I just write until it all ties together. The writing style is often referred to as Pantsing. No, I don’t mean pulling someone’s pants down around their ankles and laughing. It’s derived from the phrase ‘flying by the seat of your pants’ which was coined in the early days of aviation when pilots flew their planes without instruments to help them. Now, I have read ‘writing advice’ from some very famous authors saying that you should never write the first word until you know the ending of your story. I have also read the exact opposite advice from other authors just as famous. What this tells me is that no one should give writing advice as if it’s the Gospel. So here’s some absolute Gospel writing advice… Do it the way that works best for you. Try Plotting, which is the opposite of Pantsing, and outline the whole story before you start. Most teachers will tell you to do this. The problem is that most teachers are trying to get you to write term papers and essays, not fiction, but I digress. Try it. It might work fine for you. If not, you may be a mix of a Pantser and Plotter. Or, you could be like me and be stuck with letting the story tell itself. OK, OK, so what does all this have to do with the blog title? What is Cooperative Pantsing? What does Pantsing have to do with being a Dungeon Master for an RPG? Well, I’ll lay it out for you… but first, let talk about what happens in a typical D&D campaign for the uninitiated. The DM (Dungeon Master) creates (or borrows) a world. They decide the rules that govern reality in this world (does it have magic, high technology, psychic powers, normal boring Earth existence), the physical shape and make-up of the place (land, water, space, etc. ), and what its current state of political existence is (unexplored frontier, a cityscape, medieval towns, a deep dark dungeon, a wide land full of empires and city-states, a loose conglomeration of un-allied planets in a strange galaxy, anything you want, really). For example, Dungeons & Dragons 5e campaigns often take place in Faerun, a massive continent that is both ancient and unexplored in a time of swords and sorcery. The players (PCs) create characters of various classes (jobs with skill sets) and races (types of beings such as Humans, Elves, Dwaves, Gnomes, Tieflings, etc. – There are many). They take those choices and combine them with some random dice rolls to come up with a unique character that they add other customization options onto within the rules of the RPG being played. Next comes the really fun part… the backstory. The players decide WHO their character is, what happened to them in the past, what their motivations and personality are, all the things that make them an individual. The DM also comes up with a quest, or series of quests in which the players engage. It may be a huge over-arching one, an unplanned free-form series of them that are thought of on the fly, or a combination of the two. Examples: Free the kidnapped villagers. Kill the dragon terrorizing the countryside. Rob the rich noble or the wizard’s tower. Find a valuable treasure in the deep dark dank dungeon. A Dungeons and Dragons campaign is a cooperative creation of a story generated by the same method a Pantser uses to write a novel. The DM invents (or borrows) a world, and creates an instigating action. This is the same as establishing the initial idea for a novel. The Big Problem or Antagonist(s) causing it set the stage for the conflict to be overcome. The Players are inserted into this world and must deal with the situation(s). This is how I create the main characters of a novel. They are the heroes of the game or the protagonist(s) in the novel. In this case, the players will do it themselves, but there are writers who claim that their characters define themselves as well. I’ve experienced this to a certain degree myself, although I keep a tighter rein on my characters. They are MY voices after all! The DM describes/decides how the world reacts to the players’ decisions within its established ruleset. The author does the same for the setting in a novel. They might introduce other characters to help further this, which is the equivalent of creating NPCs (Non-Player Characters) in the D&D game. Those characters have their own motivations, goals, and personalities that the PCs have to then deal with. The Players develop, change and grow during the journey. Character development is a primary key to any good story. Sympathy (or Antagonism to) the characters is what helps a reader invest in the outcome of the story. In the case of D&D, it’s what keeps the players interested and provides the enjoyment to everyone, including the DM. The DM leads the characters toward the major event/conclusion/Big Bad Evil Boss, but the characters/Players decide how they want to get there. The route can be very circuitous at times, and a good DM rolls with the punches. This is how a Panster must write the middle of the story as the main character’s personality dictates their reactions. It’s even worse when you have no control over the decision process like a D&D game. I have often compared DMing to Herding Cats! I can’t imagine how painful it would be to be a Plotter and try to do that with a D&D campaign! It would all be wasted in a heartbeat! So, if you are a budding writer with a desire to create, but you just can’t seem to keep up with those strange voices in your head. You know, the ones that keep going in directions other than the ones you intended? Maybe you should take break and try being a Dungeon Master for a bit. You’ll gain valuable experience in Cat Herding that you just might be able to use to your advantage in writing. You’ll also have a lot of fun in the process! Check out my books over on Amazon.com! I currently have two published. Both are available on Kindle Unlimited, and on Kindle Owners’ Lending Library for free if you have Amazon Prime. If you like intrigue, humor and a bit of speculative technological supposition, you should pick up a copy of my technothriller-comedy eConscience Beta from Amazon today! Peacekeeper Incorporated’s breakthrough nanotechnology could bring repeat offense crime to an end, freeing society from the need for criminal incarcerations. But first, they have to finish testing it. With funding on the line, and time to prove out the project getting short, the lead scientist must find a way speed things up. That’s unfortunate for his guinea pig, and anyone who would stand in his way. Can the goal of ending most crime justify committing one… even a few? And what happens when you conflate altruism with egotism? Find out in eConscience Beta, where two lab techs and an uncouth petty criminal must outwit a brilliant but sociopathic scientist who’ll stop at nothing to establish his legacy as the man who ended crime. If Science Fiction Space Adventure is more your speed, then you should check out my anthology, Horizons Unlimited: Volume 1. Matter conversion technology—Matt-Con—has broadened the scope of mankind’s existence. It has opened up the real possibility of viable colonies on other planets in our solar system, and even space itself. Anywhere matter can be captured or energy from the sun can be felt, the possibility of expanding human habitation exists. 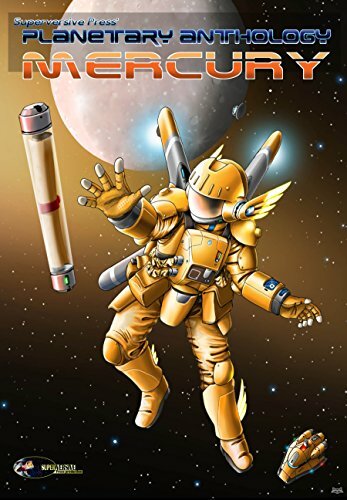 The space station Chariot of Helios—on its way to Mercury to become a power collection station for Earth’s growing need for energy to power matt-con tech—encounters a strange anomaly that threatens ship and crew. The sudden destruction of mankind’s first atmospheric terraforming platform leaves three unlucky exonauts struggling to survive in the skies of Venus aboard a cobbled-together airship. Meanwhile, the commander of the space station above battles obstacles that might keep her from rescuing her stranded husband and crew in time. Character flaws are things to be fixed, not justified or glossed over. That’s the biggest reason that I cannot give this second book in the Freelancer series anything higher than 2 stars. The usual thing to do with a character is to have them start out flawed, then recognize that flaw (usually after it lands them in the crap) and then correct it. When you start with a Mary Sue with two big flaws that she (and maybe the author?) can’t see, then don’t fix it but carry it over to the next book… you get a repeat. The same problem Kari had before (easily manipulated) is still there. The other issue is that the ‘flaw’ that she sees in herself (getting people hurt because of her actions) is not the REAL problem, but it BECOMES one even while she extols her virtue for not having done the necessary thing to keep evil from continuing. On no less than five occasions I found myself saying… just kill the guy and damn the consequences… don’t play the game his way… but no, the pages just kept going. *sigh* The dummies on the television don’t listen to me either. This rest of this review is a spoiler. I don’t have any more time to spend on a 2-star trying to keep it from being one. Read ahead at your own risk. After escaping the clutches of a power hungry manipulative egomaniac (who happens to work for the government) and almost being killed along with the boy she didn’t even know she liked (but apparently everyone else did?) in the first book, Kari the super-hacker, aka Freelancer, tries to settle down to a normal life of self-indulgence. Unfortunately, she manages to fall into the clutches of a power hungry manipulative egomaniac (who happens to want to overthrow the governments…both of them, as the U.S. is now in a second Civil War). So, hopefully, you can see my problem here. She learned nothing from her first hellish, mind-scaring, life-trauma event and simply fell into the next one. For a person who is super-smart and can solve so many problems, she is beyond naive. It’s so bad that it completely ruined my suspension of disbelief. I knew who the bad guy was the instant he was introduced. The whole YA silly teen/young-adult relationship thing just added a level of obnoxious to top the whole thing off. And that’s why it gets two stars and no more of my time. I’m skipping book 3 because I fear it will be just more of the same. View all my reviews on Goodreads, or look for them here on the blog!